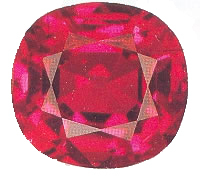 Ruby is the trade name for red corundum and it is projective in nature. Its chemical composition is aluminium oxide with a hardness of 9 and a trigonal crystalline structure. Ruby can range in color from rose to dark purplish or brownish red depending on the chromium and iron content of the stone. It is used to enhance the positive vibration of certain masculine numbers. It works as energy booster. While operating key or leadership role, ruby can give you the confidence to make correct, stubborn and timely decisions.